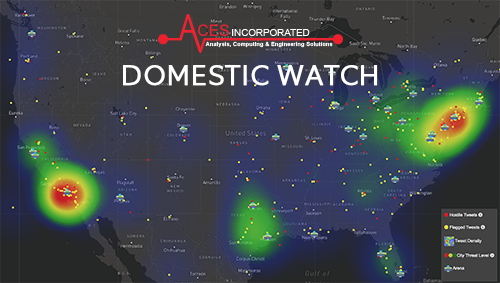 ACES, Inc's new Domestic Watch wins award in EPIC App Challenge - ACES, Inc. The EPIC App Challenge provided a broad problem set which required teams to look for real world problems that could benefit from the use of technology to help solve that problem. ACES, Inc. looked at a number of different problem sets but felt compelled to focus on ways to help prevent horrible events such as the shootings at schools and public venues. The recent shooting at the Madden NFL 19 gaming tournament and recent school shootings had stuck in our minds as a possibly preventable events. Could the suspects use of social media leading up to the event have been used to tip off authorities before they were able to commit these horrendous acts? It was with these thoughts in our minds that we set out to try and build a proof of concept that could help prevent these types of events. Our Domestic Watch application utilizes open source data, machine learning, and threat analysis to map and alert subscribers to potential threats at public events and venues. We started by gathering Stadium and Venue location information as well as scheduled sporting events to monitor. We then process streaming data feeds from social media sites such as Twitter, Facebook, and Google Trends and attempt to match them against a list of DHS approved Keywords for Infrastructure Security and Domestic Terrorism. Utilizing these keyword filters and sentiment analysis, Domestic Watch builds Target Profiles of potential threats within specific areas. These Target Profiles are then used to train Facial Recognition software automatically. With trained models in hand, Domestic Watch is able to monitor live video feeds from venues watching for potential Targets who are in the area of a public event/venue. If targets are seen by Domestic Watch, it immediately notifies parties of interest (local police, security, administrators, etc) of the potential threat. 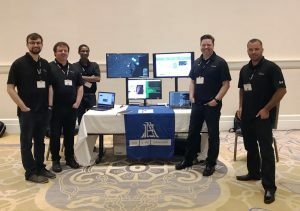 ACES, Inc. had a team of 5 developers working on the App Challenge over the 10 day period and learned a great deal of new technologies. EPIC App Challenge participants were provided with access to Microsofts Azure Cloud Platform which we could utilize if desired. ACES, Inc. made the decision early on to utilize Azure’s cloud offerings as much as possible even though we have never used it before. 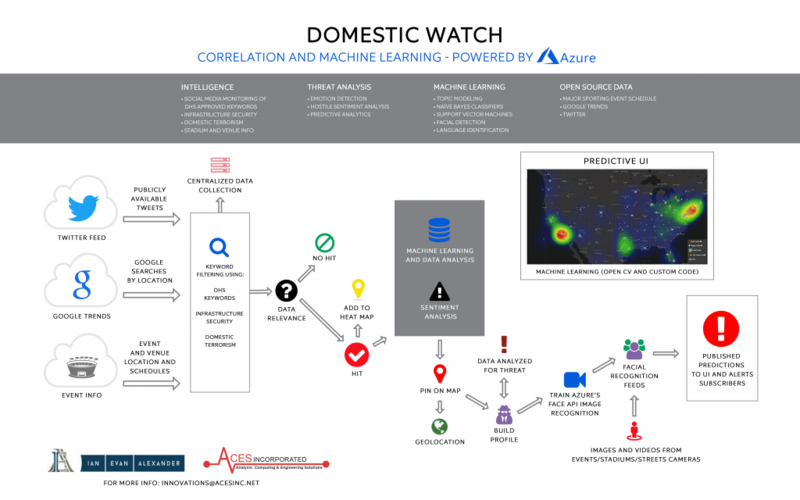 Domestic Watch was deployed to a Kubernetes cluster running on Azure and utilized the Azure Cognitive Services to provide a cloud based, scalable product that was useable within the 10 day period. Our technology stack included Microservices built using the Spring Framework which were containerized using Docker and deployed to Kubernetes. We also utilized OpenCV and the Azure Face API for facial recognition both locally and in the Cloud. Our user interface includes a Target Dashboard and a Leaflet map which displays hot spots of activity as well as locations of Target messages, Venue locations, and Alerts with live images. ACES, Inc. was pleased to participate in the App Challenge and looks forward to participating in other challenges which both help us to grow and get to know other capable companies within our space. These challenges also give our developers opportunities to expand their horizons and think about problems in new, exciting ways which help them solve hard problems for our customers. Thank you again to AFCEA Emerging Professionals in Intelligence Committee (EPIC) and INSA Intelligence Champions Council for hosting and sponsoring the App Challenge! Thank you also to Microsoft for providing Azure capabilities to participants as well. If you are interested in learning more about Domestic Watch or how ACES, Inc. can help you solve problems in the future, please Contact Us!